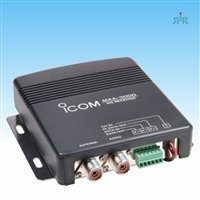 Icom marine navigation system, marine AIS, ship radar. Marine Commander is integrates various marine modules such as a fish finder, marine radar, AIS and VHF transceiver into the multi-function displays (MFD). Up to two MFDs can be connected to a main processor unit (MPU) and support separate dual display operation. If connecting two Marine Commander MPUs over a data cable, up to four MFDs can be used and the connected modules (E.g. fish finder, radar) can be shared with the other MFDs.